From absolute film to psychedelia, this program of revelatory moments from the history of visual music and kinetic art explores lost, legendary and rare treasures from the archives of Center for Visual Music (CVM). Featuring the east coast premiere of the newly discovered film by John Cage and Richard Lippold, The Sun Film (1956), about the kinetic art sculpture. Rare works by Jordan Belson include his infamous LSD (1962); a presentation reel from the legendary San Francisco Vortex Concerts (1959) and Quartet (1983). 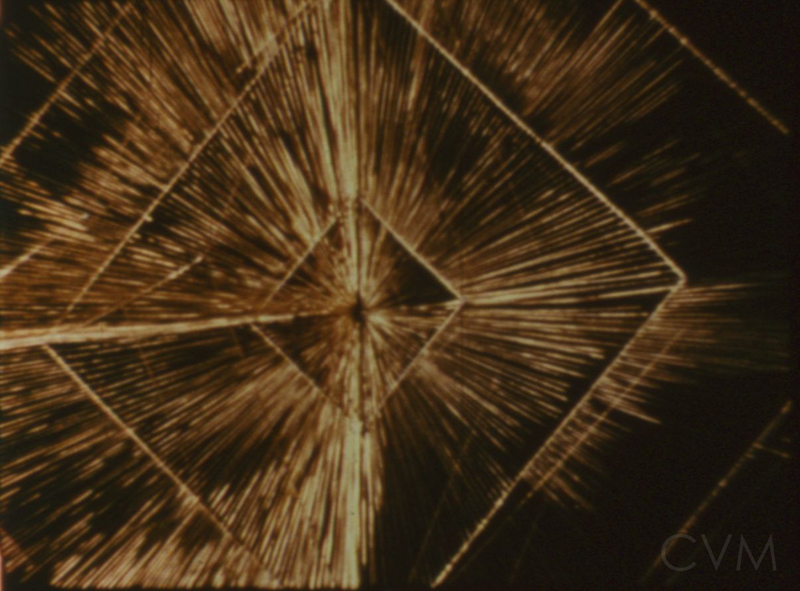 Early films by Oskar Fischinger, an influence on Cage, Belson and many others, include Ornament Sound (1932) and newly preserved 35mm prints of Spirals and Studie nr 5. Made in upstate New York, Turn, Turn, Turn (1966) by Jud Yalkut is ‘a kinetic alchemy of the light and electronic works of Nicolas Schöffer, Julio Le Parc, USCO, and Nam June Paik’ with sound by USCO.' Plus films by Charles Dockum and Mary Ellen Bute. The program featuring many newly preserved 16mm and 35mm prints, will be introduced by curator/archivist Cindy Keefer of CVM. Laura Kuhn, Director of the John Cage Trust, will introduce The Sun Film by Cage and Lippold. "An evening of magnificent audio-visual pleasure and knowledge." - Film Historian and Professor David James. Los Angeles Times Critics' Pick (December 2013 screening), regarding Cage, Lippold and The Sun films, by Mark Swed. Oskar Fischinger, Ornament Sound, c. 1932, 35mm, b/w, 2 mins. Drawn sound by Fischinger. 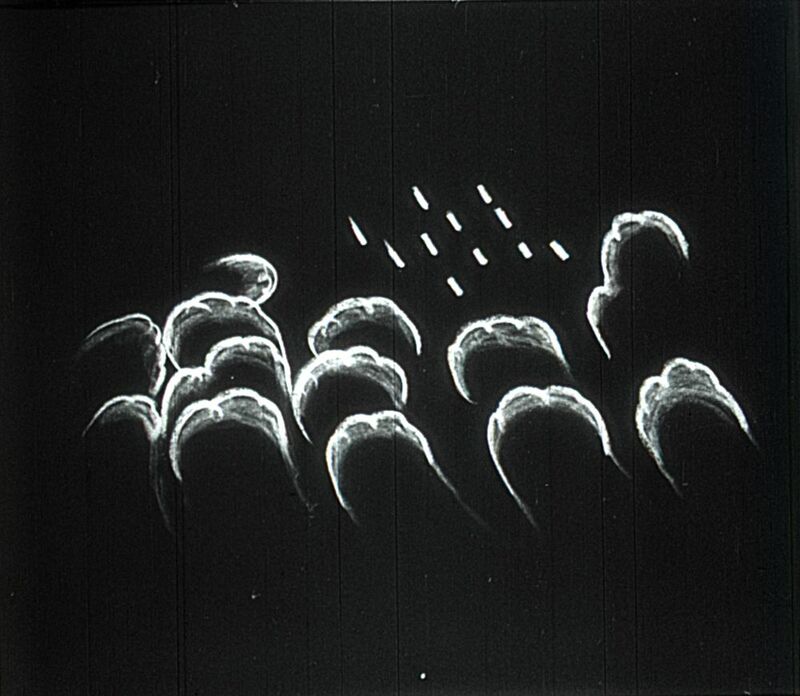 Fischinger photographed graphic shapes and icons, “ornaments,” onto the film’s optical soundtrack for this early experiment in synthetic sound. This compilation of experiments was assembled by Moritz for The Fischinger Archive in the 1970s. Fischinger seems to have made many of these experiments, likely dating as early as 1930, though few have survived. One of his texts about this work is online here. Jordan Belson, Bopscotch, 1952, 16mm, color, sound, 4 mins. A very early pixillated film. Belson used traditional animation techniques in his early films, until c. 1959. Jordan Belson, Vortex 5 presentation reel, 1959, 16mm, b/w, silent, 7 min. New preserved print. One of Belson’s compilation reels which he combined with colored filters, stencils and various lighting effects. Belson was Visual Director for The Vortex Concerts (1957-59) at San Francisco's Morrison Planetarium, a series of c. 40 electronic music concerts accompanied by visual projections. Composer/sound artist Henry Jacobs curated the music while Belson created visual illusions with multiple projection devices, combining planetarium effects with patterns and fragments of abstract film footage. 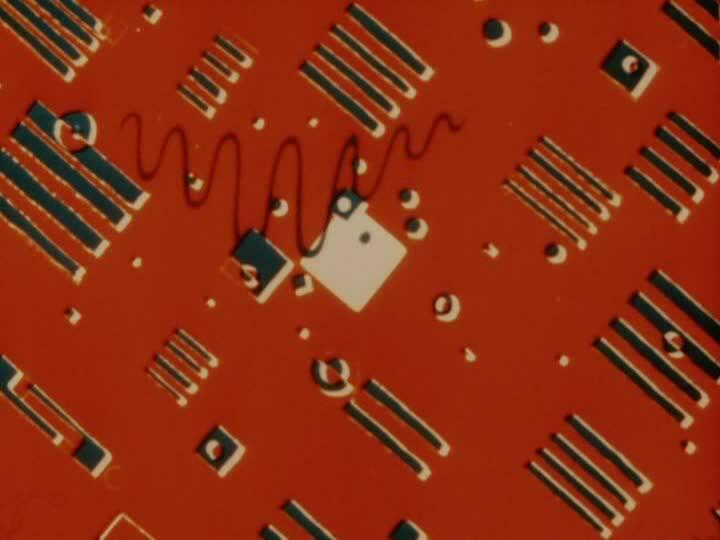 (Keefer) Image from Hirsh's oscilloscope footage, given to Belson to incorporate into his compilation reels, along with Belson's footage and effects. 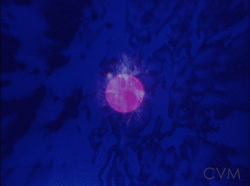 Jordan Belson, LSD, c. 1962, 16mm, color, sound, c. 5 min. Sound by Belson. New preserved print. Belson didn’t screen this film, stating it was simply an unfinished project representing the zeitgeist of this time, not a finished film. John Cage & Richard Lippold, The Sun Film, 1956, color, silent, c. 6 mins, and The Sun, Variations within a Sphere No. 10 [documentation], 1956, color, silent, c. 7 mins, new preserved prints. Two films on the construction and display of Lippold’s kinetic art sculpture, edited according to Cage’s graphic score composed via chance. The films were discovered in 2010 by musicologist Richard Brown, Ph.D., a brief text about the films is online here. Mary Ellen Bute, Tarantella, 1950, 16mm, color, sound, 5 min. Music by Edwin Shershefsky. Print from the Cecile Starr Collection at CVM. In 2010 Tarantella was added to the National Film Registry of the Library of Congress, an honor recognizing films of historical significance. Charles Dockum, Mobilcolor Performance film, 1970, 16mm, color, 11 mins, silent, new preserved print. Mathematically composed color-light projections performed as music, with Dockum’s Mobilcolor Projector in Altadena, CA. Jordan Belson, Quartet (unfinished), c. 1983, 16mm transferred to HD, color, silent, 10 mins. Several versions of Quartet were found in Belson’s studio after his death, though none completed with music.